Vincents is a perfect place to meet and enjoy our meals. Enjoy your drink in our bar or taste our local meals which are prepared in our open "on stage" kitchen. Are you a lover of cooking then a visit to Vincent's Kitchen Boutique is definitely worth it! Our boutique consists of a cooking studio, cooking store and an inspiration library. We love sharing our knowledge of honest foods with you! Did you enjoy a nice dinner? Or a visit to the Van Gogh church or another beautiful place? Afterwards you can unwind in the comfortable rooms of Vincents Bed. Agenda; at Vincents there is always something to experience! You can find more information about the workshop given by Vincents, the overall agenda of the upcoming events and more information about the Vincent's cooking club. Vincents Bar & Bistro – Bed & Boutique is located in the centre of Etten-Leur, just opposite the Van Gogh Church. In addition to being a three star hotel you can follow various cooking workshops in Vincents cooking studio, while you can find everything in the cooking boutique that will enable you to cook just as deliciously at home. So in addition to being able to stay overnight and eat, you can (learn to) prepare food and imitate the art of the chefs. Its lively, surprising and involved atmosphere makes it a place you can happily enter at ease. The bistro has views of the Markt (Market Place) and the famous Moeierboom (Mother Tree). The entrance to the Van Gogh Church is visible through the abundant foliage. 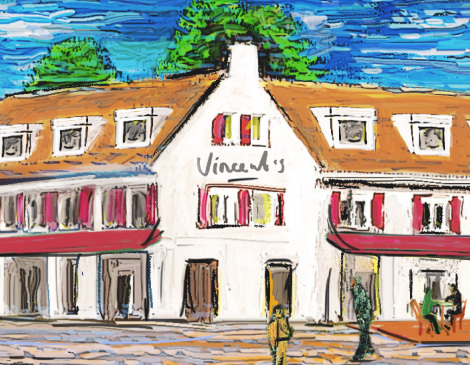 The name Vincents is inspired by Vincent van Gogh. His family lived in the rectory behind Etten church from 1874 to 1882. He often returned there for extended periods when he was in financial difficulties. It was there in around 1881 that he learned the basic techniques of his subject; it was therefore an inspiring learning environment. And what could be better for people who appreciate Van Gogh and good eating than to learn to cook less than a hundred metres from where one of the Netherlands’ greatest artists learned to paint? Vincents is a great place to meet up or have a chat, possibly after visiting the Van Gogh heritage location on the other side of the market place. The ‘Around the Van Gogh Church’ tour also starts here, which includes all the important Van Gogh locations in Etten-Leur. Being within walking distance of the station and on the Van Gogh Cycle Route, Vincents is the perfect stopping off place for walkers and cyclists. You should really make time to have something quick to eat and drink at Vincents, where the multilingual staff will be happy to tell you more about Van Gogh’s Etten period.